It is possible to create custom menus in ZBrush so that you can group together those items you use most and improve your workflow. 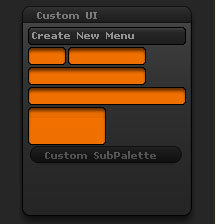 Before creating new menus you must turn on Enable Customize in the Preferences>Config sub-palette. Create a new custom palette. Custom palettes can be filled with items from the ZBrush interface by Ctrl+Alt+dragging. A hotkey can be assigned to the palette by Ctrl+Alt+clicking on the title bar. Pressing the hotkey will bring up the palette at the cursor position. There are various sized fillers for helping in the design of custom palettes and menus. Create a new menu for adding to a custom palette.